I've been somewhat lacking on the blog side of things since the birth of my third daughter, as the brain has ceased to function adequately sufficiently to be able to power any relevant thoughts! There has been a slow down in the number of posts registered by firms in recent weeks. 75 new solicitors registered in October (excluding QLTT, paralegals and other applicants), and only 57 vacancies (although we are well over 100 for November). We have seen a rather large increase in the number of firms wanting wills & probate solicitors, conveyancing lawyers, locums and a slow rise in crime solicitor requests even. Standard for the time of year though - nothing extraordinary in terms of numbers. For permanent placements the fields of law are shifting, but there are posts there in all areas for all shapes and sizes of firms. Still no sign of the conveyancing job market crash that has been predicted with the HIPs and the Northern Rock collapse. LSC work slightly picked up thanks to announcement that an announcement will be made in January 2008. Plenty of firm closures and mergers though as a result of the LSCs complete and utter disregard for making rational decisions! The Pre-Christmas run up is always quiet - there are better things to do for most people than to look for new posts (although getting dragged round shops is too much for me, I'd rather Amazon it! ), and pretty much everyone decides to go Christmas shopping instead of staring at legal recruitment pages. We wait with anticipation every year for all those solicitors who get to New Years Eve, drink a little bit more than they ought, and make a brave decision the following day to up sticks and move onto pastures new. One of our consultants has managed to ingratiate themselves with a larger Magic Circle firm, and hence our corporate and commercial law recruitment has picked up with the registration of 40 new corporate vacancies across the board. Conveyancing is still good - lots of work on both the temporary and permanent side coming in. . In the temporary fields - TP Locums - www.ten-percent.co.uk/locum.htm - is finding increased numbers of assignments out there, although we are not as busy as usual for locum work. We are expanding our work in this area, and hope to have over 20 locums running full time with us before the end of 2008. At present we are about 1/3 of the way there on a regular basis. Commercial litigation still remains a barren wasteland, although the recent acquisition of vacancies from a larger sized player means we now have a few new ones. Commercial property remains busy, and there is a real lack of any good candidates in that field at times. Property litigation as well seems to be the 'in' thing, and I expect this to increase in time, as more and more issues arise for the new generation of landlords out there. I know that firms advertise commercial property posts for years on end, and it always makes me smile to see yet another of the big agencies taking a vacancy on a retainer in the Gazette knowing that it is unlikely they will fill it for a year or so. Remains the same in London, but we are recruiting still across the UK for duty solicitors and accredited reps. Number of firms actively looking, although I did get an amusing call this week from a senior partner wanting me to head hunt one of his staff so he didnt have to fire them! Never been asked to do that before! To add to the above mournful rant, I have to say that a number of firms have started to recruit, perhaps to keep their heads above water or to gamble on the announcement in January 2008. Seen this pattern before, and will be awaiting the redundancies by March! This year the key fields of law on the high street side so far remain wills & probate, conveyancing and commercial property. Commercial litigation and personal injury remain extremely difficult to source work for on the NQ front and in fact we still get many litigators contacting us about each litigation post coming up in London. Personal injury has picked up a little bit in recent weeks, with posts being registered in different areas. Crime - www.crime-solicitor.co.uk - see above as well for mournful rant on this! Wills & Probate has been an interesting field. Large number of firms looking as they have seen the potential in dealing with IHT work and trusts, which is inevitable following recent house price boom. Quite a lot of vacancies have also come into us from other areas in this field, with increasing numbers in the North West. East Anglia and the Home Counties are doing well at present, together with the South Coast, and the East Midlands is resurgent. London posts remain few and far between. Try visiting www.jonathanfagan.co.uk if interested in receiving further details for private client posts. The South West has seen a massive request for CVs whenever we get a candidate in who may be of interest. Recently experienced such a surge - we arranged over 5 interviews in one day for a middle level wills & probate lawyer in the South West. Not that mad at all - still posts there, but not that many - Carter has caught up I think... - although outside of London anything above 3 years PQE and if possible panel applications in already is going to result in interviews although this is starting to change with family lawyers needing to move out of London to find work. This remains a poor area to be looking at NQ level though - if you are a panel member outside the North East (which historically has been very poor for family law recruitment), we would be reasonably confident of securing a good number of legal job interviews for you - the south west is a particular hotspot - Plymouth firms in particular. Corporate commercial solicitors in the West End are fairly in demand, and we currently have both contract and permanent posts in this field. I am thinking of going back to uni to do a GDL and work towards a career in law. The problem is I have pretty average A Level results, B,C,D and a 2:1 in business from an ex-poly. ( I think have always been capable, just not really motivated during A Levels.) I really want to be a lawyer but what are my chances of getting a TC? Do I have a realistic shot? Or should I spend my time and money on something else? We often get people coming to see us for careers consultations with similar situations and wanting to know definitively whether they will get a training contract. I think the first question to ask is "why do I want to be a lawyer", not whether he will get a training contract. The reason for this is because the response to the first question will usually result in the answer to the second. If there is a genuine reason for wanting to be a lawyer, backed up by sound evidence, Dan will already be halfway there in any event - he will have experience of what exactly a solicitor does in practice (ie he will have work experience in a private practice firm or other environment), he will be aware of what a barrister does and hence why he is looking for a training contract as opposed pupillage, and he will understand what the study of law is all about at GDL level. And will have researched the cost of the GDL and the LPC, and the average starting salary of a trainee solicitor outside the magic circle firms. Once he has done all of this, then he needs to think about his A levels and degree. His A levels are not bad at all, and should not be a bar to getting a training contract with a provincial or high street firm. It is very likely he would struggle to get interviews at magic circle and firms in central London attracting 5000 applicants per training contract, as unfortunately firms do have to benchmark, and the best way to do this for legal recruitment is to use former academic results. You will see on the right hand side testimony from someone who got a 3rd class degree and very low a level results, who is just completing her training contract. Its all in the mind - progressing at law is about getting your foot in the right door at the right time if you are not a conventional AAA, 2.1 red brick Uni, nice school straight into 300 partner central London practice! Every year since I started back in 2000, ten-percent have been approached by a range of people wanting to set up and run a solicitors firm. I have known financial advisers, claims management companies, accountants, estate agents, businessmen, all wanting a piece of the pie! I think that some of the other professions see what a solicitor does, see how much they bill and how little they seem to actually do, and see pound signs flashing before their eyes! The harsh reality is that there is so much red tape and so many issues such as indemnity insurance, that in fact it is not worth employing solicitors in house to provide a service to the general public, which of course is the point at which you need to be a solicitors firm. I have known some of the large service companies set up their own firms - we once had dealings with Capita and a law firm they had established which was directly linked to the plc. Once the new Legal Services Bill comes into being (or whatever it is now called), there is the possibility for multi-disciplinary partnerships, and it is at that time I think that the whole area will become more open. At present though, there isnt much scope there for employing solicitors to work with the general public and provide a service, unless you want to go through the same rigmarole a solicitors firm does, and in which case you could probably pay the same money and use an external law firm. In the meantime, if you want to set up a legal service, the first port of call should be the Law Society - www.lawsociety.org.uk - they should be able to advise whether your plans are viable or not. We have assisted an estate agency who set up a linked law firm, and undertook all the conveyancing coming through their doors on an in house basis. They had two solicitors running the whole operation including the estate agency, which must have made a big difference. Locum work is something of a legend in law. It is said that locums can be millionaires, and that they are constantly in demand, jumping from one post to another, generating vast amounts of income on £60 per hour rate. The reality of the situation is somewhat different, although there is some truth that locum work is quite rewarding financially. a) they want to find a permanent job, but havent been able to. b) they are professional locums, just taking assignments to book up their year as wanted. c) they have other interests - eg wanting to ski for 4 months each year, and work the other 8 months to pay for this. Usually on the high streets of England and Wales the locum rates fall between £18 per hour and £45 per hour, dependent on the length of assignment, the type of law and level of seniority. I have locums working in commercial property at the top end, and I have locums in housing law at the bottom end. If an assignment has the potential of going permanent the salary is usually a lot lower, and also if it is long term - eg 6, 9 or 12 months, the money tends to be less. Most of the professional locums work on a rule of thumb that they will probably get about 8 months locum work in every 12 months. Locums have to be a certain type of person - there is no security in the work - and sometimes what is billed as a 12 month assignment ends up a 3 day contract due to other factors. Locums get no notice, and have been known to leave firms at lunchtime because the senior partner has changed his mind on their appointment. If you want to have a regular income and be able to pay your mortgage and outgoings every month from a set amount, this particular career path is definitely not for you. Looking back on my years as a student, I must say that I probably had the same attitude of most others, in that i always thought that my lecturers were failed solicitors and barristers, and could never understand how half of them had the cheek to think they could lecture to me about law when they had failed to cut it, and ended up lecturers. Having spent the last few years lecturing at University for a couple of days, I can safely say that this view was considerably misguided. By the end of a 3-4 hour stint, I am completely exhausted! I feel like collapsing in a heap, and actually start to feel a bit lightheaded. I know that my one off day is somewhat different to the majority of lecturer's experiences, but to be stood before a group of students talking away is something not to be taken to be easy! Some of the groups you talk to show no sign of any interest in what you have to say - most just stare blankly back, and it is very hard to tell who is interested and who is just there because they have to be. I watch as some people look fairly engrossed, others look under the table, and others yawn and stare over your shoulder. In actual fact I reckon that the whole practice of being a lecturer is probably harder work than being a solicitor in practice, but probably easier than being a barrister, where one not only has to constantly be on one's feet, but also be able to improvise constantly. I'll stick to recruitment - probably relatively stressful, but not in the same way! One thing that crops up a lot in recruitment is the use of Skills Sections on CVs. These are the bane of every recruiter's working life (whether HR people in firms/companies or recruitment agents) - even solicitors with 10 years PQE still write them down. "good interpersonal skills, able to communicate effectively and use transferable skills in a way to benefit the firm. Punctual, generous and with a good sense of humour." I have read CV's with pages of this stuff on them, and can never understand why anyone with any common sense would not realise that there is absolutely no point including any of it on the CV. According to many students I have spoken to over the years, careers advisers at various universities and colleges have said that this is the way you do your CV, and this is the sort of thing that employers want to see. I must say that our approach (and that of other recruitment consultants I have spoken to) has always been that a CV should contain factual information only. I see many CVs prepared each week from some of the big agencies such as Badenoch & Clark and Michael Page, and they spend considerable time and effort on organising and structuring their cvs, probably more so than smaller agents. Every single one I have been sent over the years by candidates contains streams of factual information setting out numbers of files, caseloads, billing levels, types of law, any technical issues dealt with, anyone worked with on particular cases etc. I have never seen a prepared cv containing the sort of waffle I see on CVs from universities regularly. A CV should contain objective information, not subjective. How do you know whether you have a good sense of humour? Who says you have good communication skills? This is partly why you attend interviews, so that the interviewer can gauge for themselves who you are, where you are coming from and whether you will fit in at that firm or company. I am thinking of writing a letter to all the careers advisers in universities to ask them to consider this point, as i think it is so important - it can throw an employer off the scent and prevent them from seeing something really interesting and important. So if you are writing a cv and reading this - I would not use bulletpointed lists or paragraphs of information about your skills set - I am not interested as an employer - I never read them - I could probably send a good one out myself saying that I have a good sense of humour, but this would be a complete lie! 26.09.07 Solicitors Firms Websites - some good, a lot terrible! We have decided to offer a new service to law firms who register vacancies with us. This will be free, and the only catch to it will be that we must be allowed to publish an article on our site about our findings. We will analyse a firm's website free of charge. Firstly, we will give the firm a breakdown of how popular their site is, what their ranking is for searches in Google, and how visible the website is (eg - have they linked with www.solicitors-online.com?). Secondly, we will check the site for inconsistencies, spelling mistakes or grammatical errors popular with web designers. Thirdly, we will rate the site on how efficient it is at what it is supposed to be doing - ie selling the firm, providing an online service, and setting the firm apart from others of a similar nature. Fourthly we will give a forthright view on what improvements could be made - whether the site accurately reflects the firm, and does the job the firm wants it to. Interested? Simply contact us with your vacancies, and give us permission to look at your site and name your firm on our site! Hopefully our directory will become a benchmark for the industry to look at, and publicise the website designers who are any good for law firms and solicitors, and those who are awful! It is clear that the drafting of a wide range of standard contracts and agreements will fall within this, and that these traditional services will be replaced by online services. There is an enormous hole that is quite apparent in the legal market that has been called the 'latent legal market', referring to the innumerable situations in people's domestic and working lives when they need legal help. With the LSC gradually destroying the remnants of the legal aid system, more and more people are dependent on insurance products and the like to sort out their legal disputes. The internet is going to become almost a battle ground as different business models vie for success. One possible approach would be the development of a website that functioned as a central reference point for anyone seeking information or advice on a legal problem, including general information, expert systems or intelligent checklists enabling a 'DIY legal service', and one-to-one advice online from a lawyer. Obvious content areas for such a site would be high street law, but also other areas such as financial advice are likely to be added in. The legal services market is worth over £20 billion pounds in the UK. However there are still very few law firm websites that are any good or useful at attracting customers into firms. Although the online legal market is a relatively new and as yet under developed area of ecommerce, it is possible to show levels of demand using just one demographic example. As the UK population increasingly ages, the 50+ age bracket now makes up the second largest group, or more than 20% of internet users. With much more time on their hands and an increasing wish to solve their legal problems using self-help tools, there is a potentially healthy and growing client base online. This inevitable change in traditional legal practice in the UK and elsewhere was further suggested by the entry of supermarkets into the financial services industry. Although it has been joked about in legal circles for several years now, 'Tesco law' is already becoming a reality. Changes in legal practice regulations over the last couple of years and Clementi Report recommendations have now made this and other inroads the legal field a distinct possibility. Tesco's and the RAC certainly think there is much scope and want to break into the world of soliciting big time! Who will be first to corner this market? Quite obvious really unless law firms decide to buck their ideas up and start looking at the future rather than the past. A recent survey of law firm websites concluded 'when it comes to content - the crucial ingredient - they are deficient to the point of negligence' (Edward Fennell, The Times Law Report, 11th May 2004). Alternative careers for solicitors in years to come, or perhaps solicitors need to have a think about becoming both a home inspector and a solicitor - certainly looks easy money! Cost is slightly prohibitive - I have seen courses costing about 7,500 plus VAT, which compare well with the LPC! As a home inspector you would produce reports on certain types of houses offered for sale on the open market in England and Wales. You would look at the age, condition and energy efficiency of people's homes and produce a Home Condition Report (HCR) and an Energy Performance Certificate (EPC). give the property an A to G rating for energy efficiency and carbon emissions. The HCR and EPC form part of a Home Information Pack (HIP). HIPs were compulsory for houses with more than three-bedrooms from 10th September 2007. EPCs are a compulsory part of the packs, but HCRs are optional. Visit the Home Information Packs website for more information about the Housing Act, HIPs and HCRs. EPCs can be produced by both home inspectors and domestic energy assessors (see separate profile for Domestic Energy Assessor). To qualify as a home inspector you will need to complete the Level 4 Diploma in Home Inspection (DipHI), which is awarded by ABBE (the Awarding Body for the Built Environment) and C & G (City and Guilds). The DipHI is an assessment process that shows that you have all the skills and knowledge needed to do the job. It is offered through accredited assessment centres. The assessment centres will help you to compare your existing skills against the DipHI and plan your training around them. You can find full details on the ABBE and City and Guilds websites. an exam (for an example see the ABBE website). if you do not have any experience, you may need to gain a property-related qualification, such as a relevant BTEC HNC/HND, foundation degree or degree before starting the DipHI. You may be able to do an intensive course to complete the DipHI. You do not need to have any surveying knowledge to do one of these, and the courses cover everything you need to complete the final exam and produce the portfolio of evidence for assessment. They last around 12 months. If you just want to produce Energy Performance Certificates (EPCs), you can qualify as a domestic energy assessor by doing the new Diploma in Domestic Energy Assessment. The diploma is provided by three awarding bodies – the ABBE, City and Guilds (C&G) and the National Association of Estate Agents (NAEA) (see Further Information for details). As a home inspector you will be able to carry out both EPCs and Home Condition Reports. Domestic energy assessors will just carry out EPCs, but will have the opportunity to gain a ‘top up’ qualification to become home inspectors. See the separate Domestic Energy Assessor profile for more information. You must make sure that any training you do to become a Home Inspector is through an accredited course. Some centres offer both training and assessment and others will advise on suitable training. You may be able to do an intensive course or study full-time, part-time or through distance learning, depending on your circumstances and the amount of training you need. See the ABBE website for a list of accredited training providers able to offer credits towards the Diploma in Home Inspection. through your current employer if you are involved in relevant fields such as estate agency, construction or housing. The portfolio you produce for the DipHI must include 10 inspection reports, covering a range of property types. If you already have surveying or inspection experience, some of these could be reports you have already done. At least three reports must be in HCR format – your assessment centre will advise on how to complete your portfolio. After qualifying you will be expected to keep your skills and knowledge up to date by continuing professional development (CPD). Since April 2000, Ten-Percent Legal Recruitment have been donating 10% of annual net profits to charitable causes. This started with the princely sum of £500, to the last tax year of 2006-2007 resulting in about £8,750. To date we have donated £30,000, but what on earth led us to donate money, and where do we donate to? All the money we donate goes to the Ten-Percent Foundation, a charitable trust, that took copious amounts of effort to set up by me, a solicitor not used to dealing with administration of this kind! The charitable trust has a number of aims that hopefully encompass supporting third world projects, the alleviation of poverty in the UK, and promotion of society within our local communities. When we started out, we got a lot of calls from professional fund raisers, who frankly annoyed me intensely, although I understand why they are there. It frustrated me that I could be donating money to a good cause, that resulted in paying a salesman's wages, whereas I want to give money to fund particular projects and observed the results. This has been our mantra ever since. We only give money to charitable causes where we can see the end product, so a charity has to give us details of a specific project. For example we have been supporting Send a Cow for a few years now, and they have always kept us updated with information as to where our money has gone, and what difference it has made to a specific group of people. We like smaller sized charities as well, and when a solicitor indicated one to us this year, we felt we wanted to donate £2,500 to them, which I think was an overwhelming chunk of money that paid for a large part of their work. Contrast this with some of the larger charities spending millions on projects, I always find the process much more enjoyable as you get more involvement. Recruitment doesn't have to be boring! 3. Open Plan Offices - loathed or loved? 5. Newly Qualified - what do I do? 2007 has been a very busy year for most recruitment companies, as the market has expanded in most sectors, and contracted somewhat in the LSC funded work areas. For permanent placements the fields of law are shifting. Crime remains awful, although picking up slightly. Conveyancing is good - lots of work on both the temporary and permanent side coming in - although again London central not moving very fast. Other areas appear to have a bit of a shortage. Personal injury - not very good, although commercial and civil litigation have picked up slightly. In the temporary fields - TP Locums - http://www.ten-percent.co.uk/locum.htm - is finding increased numbers of assignments out there as firms struggle to attract new blood into firms, and are finding it easier to take locums for contract work and then ditch them when any source of work dries up. It remains the same as always at NQ level - just not getting the vacancies into us in the same quantity as previous years - there are firms out there interviewing at present, and there seem to be increases across the board in the amount of work available. More and more of our recruitment is now focused more on experience rather than qualification. Commercial litigation remains a barren wasteland, although we have had a couple of commercial litigation posts into us now, including an NQ one (second since 2004!). Commercial property remains busy, and there is a real lack of any candidates in that field at times. Property litigation as well seems to be the 'in' thing, and I expect this to increase in time, as more and more issues arise for the new generation of landlords out there. Things have not changed very much at all since the new laws came in from our perspective - I rue the days spent reading all the legislation and attending courses! Our agency has never discriminated on any front, and I have been happy to put forward 70 year old lawyers for NQ jobs if they wish me to. Firms can do as they please really - if they want to ignore an application they will do, but just dress it up as something else. Still lots of ads for NQ-3 years PQE solicitors, which employment lawyers were advising recruiters to cease doing. I have noticed an increase in firms taking on older solicitors, which is good. 3. Open Plan offices and solicitors - we have found that a lot of solicitors loathe them! Read full article.. I regularly add articles to my online blog about legal recruitment techniques and guidance on interviews, candidates, recruitment processes, salary levels, increasing fees, marketing, advertising etc.. You can view the blog by clicking here. If you would like to see our full lists of vacancies, simply click here to visit our online searchable vacancy database. 8. You do the head hunting, we do the work! 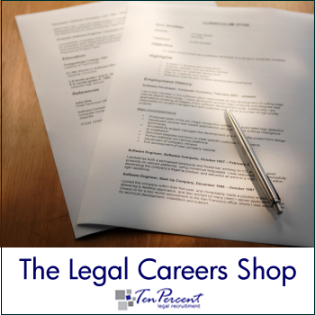 Did you know that Ten-Percent Legal Recruitment offers a mail out service? If for example you are a 4 year PQE conveyancing solicitor wanting to know what opportunities there are in North London, we can contact every firm in the area within 72 hours, and let you know of anything arising. There is no charge for this service, and all information is strictly confidential. We do all the work - sending out a CV once you have approved the firms who are interested, arranging the interviews etc.. Contact us at cv@ten-percent.co.uk to express an interest. We simply need the geographical locations you are interested in, type of law, current salary levels and notice periods. Ten-Percent Legal Recruitment offers a findasolicitor service to the general public for free. If you would like your firm to receive recommendations, simply email us to tell us why, and the areas of law, and we will add the firm (or you) to the list. There is no charge for this service. I look forward to hearing from you if we can assist. Over 4,500 solicitors and legal executives have registered with us since April 2000, and we offer our services to all UK firms, large or small. Welcome to our Autumn newsletter, sent out to firms who have requested candidates from us or used our services in the previous 12 months or so. Although you can use our standard contingency recruitment service (ie we find you a candidate, you pay our flat rate), did you know we also offer a service guaranteeing discounted rates and free candidates if placing more than two in any 24 month period? Our retained consultancy service offers discounted advertising in the Gazette, discounted rates on our fees, and free candidates if we place more than 2 with you. Visit our website for further details.... http://www.ten-percent.co.uk/er.html (follow the links for 'Fixed fee sole supply and retained services'). A free guide available simply by clicking here. Although some of the advice is fairly logical (ie do not throw things at your staff), there are plenty of tips and guides into considering things from the employee's perspective, and thinking about the way you both treat and behave in front of your staff. If you would like to see our full lists of candidates, simply click here to visit our online searchable candidate database. Alternatively, to register a vacancy and let us do the search, simply click here to fill out our online registration form. Interview question - interests and hobbies? Interview Question - activities and interests. A common question in an interview is to ask the interviewee what interests and activities they have outside of work. It is an interesting question, as it tends to throw a lot of people who have spent many years studying followed by many years working. However I have noticed something during my time as a recruitment consultant, which is that those who make it in the profession tend to have something they do out of hours which is interesting or sporting. It is rare to find a lawyer who just does law, reads the paper, and watches football. There is almost always something else there, whether it is playing rugby for a local team, working as a volunteer for a local charity - you name it they do it. 05.09.07 What is a sole supplier arrangement for a recruitment agency? A sole supplier arrangement is one where a recruitment agency handles all the aspects of recruitment for a specific vacancy or length of time. Firms can benefit from being able to hand over the entire recruitment process from start to finish, with the exception of the interview itself. We offer this service, and usually also offer discounted advertising in the Law Society Gazette as well. Where you see this in adverts (usually a sole supplier will put "please note that this ad is being handled on an exclusive basis by Blogs and Blogs and all third party applications will be forwarded through to them") it means that a recruitment agent is handling the post as a supplier. I once handled a Bermudan job on a sole supplier arrangement, and fielded in the region of 200 telephone calls in a week. I had over 40 applications to put forward from about 75 CVs received. Lots of applicants - can't think why! The workload can be tremendous, depending on what type of vacancy you are advertising, and having a consultant deal with it can also result in extra applications, as approaches can be made anonymously. For details of our service, please visit our employer pages at www.ten-percent.co.uk/er.html and follow the links. Quotes available by return email. 04.09.07 "Hello, I'm an LPC graduate, can you help me find a training contract?" The very quick answer to this query is usually no, followed by a very pregnant pause. The person telephoning almost sounds surprised! I am more surprised that someone has been on our website, found our details, and managed to miss just about every warning we have on the pages that we simply cannot assist potential trainee solicitors and LPC graduates as there is no market out there for them..
My next piece of advice is pretty much the same - you will find that virtually every other agency will say the same thing, and you will probably be wasting your time calling round. The best thing to do is to look on our website and follow the career centre links, clicking the law student option, and download our free guide to finding a training contract and work experience. This contains a sure fire way of getting work experience, a foot in the door, or even an elusive training contract!